The Filipino beef empanada is a half-moon-shaped turnover with a semi-sweet dough and savory beef filling. Just like the Chicken Empanada, the meat is cooked with vegetables like potatoes, bell pepper and green peas, with an optional ingredient : raisin. Empanada is a Spanish word meaning meat pie. It is a turnover or a pasty filled with meat and vegetables, and deep-fried or baked. Nowadays, you can fill an empanada with almost anything, from savory meats to sweet desserts. Taco Bell here in NJ sells one that's called Caramel Apple Empanada. 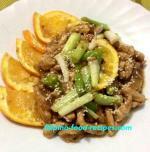 It is no different from Jollibee's Peach Mango pie. The dough for this particular recipe is much easier than the Chicken Empanada dough recipe also found on this site with the roll-in fat. I saw this dough recipe from Daisy Cooks show of Ms. Daisy Martinez, one of my favorites Hispanic TV chef and personality. I added sugar to her recipe since the Filipino beef empanada dough is a little on the sweet side. You might wonder why there's vinegar and egg in the recipe. The vinegar helps the dough become manageable, and the egg helps bind everything together so it doesn't disintegrate while rolling and filling. Believe me, this dough recipe works and it's so easy to make. 1 Fry the potatoes until golden brown, then set aside. 2 Saute the garlic and onion for a minute, then add the beef and cook for a few minutes until almost fried. 3 Add the bell peppers, and season with salt and pepper. 4 Set aside and cool down completely. 5 To make the dough, mix all dry ingredients together such as flour, sugar and salt. 6 Cut in or mix in the shortening, until the mixture looks like wet sand. 7 Mix together all liquid ingredients such as egg, vinegar and cold water. Add into the flour and shortening. 8 Mix together until smooth, do not knead. Then wrap in plastic and refrigerate for 30 minutes or until ready to use. 9 To assemble : Cut the dough into approximately 1/3 cup measure, roll like a ball. 10 Flatten each ball into 5 inch circle and fill the top half with 1 1/2 tablespoons beef filling. 11 Fold the bottom half over and seal the edges using the tines of a fork. 12 Set aside, refrigerate while doing all the rest. 13 Heat up about 2 - 3 cups cooking oil, and deep-fry the empanada until golden brown. 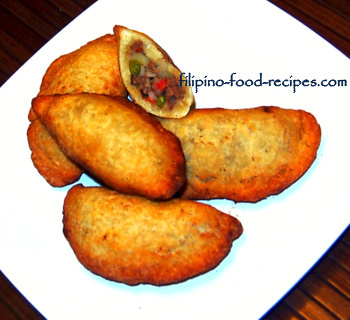 You have an option of baking instead of deep frying this Filipino beef empanada. Pre-heat the oven at 350 °F. Brush the top with eggwash (1 egg:1/4 cup milk mixture) and bake for 20 - 30 minutes or until golden brown. It is important to use cold water in the dough to get a flaky crust. The potatoes need to be fried before adding in the saute to rid of extra moisture that could spoil any leftover filling. You could add about 1/2 cup flour as binder for the beef so the filling don't fall apart once you bite into the empanada. I put the raisins as optional for my recipe of Filipino beef empanada since I've met more people who dislike them on a turnover than those who like them, but it's always your preference.